150J8 Poly V Belt, CONSUMER BRAND | 150-J8 Micro V Belts | Metric PJ381 Motor Belt | 15 inch Ribbed Belt (381mm) Length, 8 Ribs. Home > Heavy Duty V Belts > Poly-V Ribbed (Micro -V) Belts > J, PJ Section Poly-V (Micro V) Belts - 3/32" Rib Width. > 150J7 Poly-V Belt, Industrial Grade. Metric 7-PJ381 Drive Belt. > 150J8 Premium Poly-V Belt. Metric PJ381 8 Rib Belt. > 150J8 Poly-V Belt, Consumer Brand Metric 8-PJ381 Motor Belt. 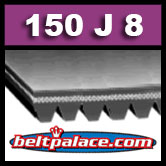 150J8 Poly-V Belt, Consumer Brand Metric 8-PJ381 Motor Belt. 150J8 Poly-V rib belt. 8 Ribs. 15” (381mm) O.C. - PJ381 Metric belt. CONSUMER GRADE “J” Series Poly-V (Micro V) ribbed belts are designed to replace OEM belts on extra heavy-duty applications such as 150J8 sander/planer belts, compressor belts, 150J8 (8-Rib PJ381) fitness drive belts, and electric motor drive belts. AKA: J8-150 Belt. Bando Rib Ace (BNO) 150J-8. Husky/Campbell Hausfeld BT011900, BT011900AV, BT011901AV, WL650702AJ belt. Metric Poly V: 8-PJ381 (8/PJ381). Consumer Grade OEM spec Campbell-Hausfeld BT011900, BT011900AV belt. "BELT ONLY" FROM COMPRESSOR BELT KIT, Part number(s) BT012100AV. Full kit: Campbell-Hausfeld WL015303SJ. LIMITED STOCK. CALL FOR AVAILABILITY!